Red carpets are undeniably glamorous, and the stars that walk them often look pretty close to perfect, with their outfits carefully constructed to earn maximum style points. From flowing gowns to short dresses to the occasional suit, red carpet fashion is all about dressing up. And while these looks are right on point at movie premieres and awards shows, they wouldn’t exactly work for walking to class or catching a movie. So to get your fashion fix while maintaining an everyday look, I’ll be translating a star’s red-carpet look each week to a wearable, real-life version. This week’s look is Emma Watson’s floral Erdem dress that she wore to the premiere of "The Perks of Being a Wallflower" at the Toronto International Film Festival. Emma’s dress combines three major fall trends -- pattern, peplum and lace -- and it pulls them all together into one cohesive look. The dress itself is a statement and with all three trends working successfully together, it strikes just the right balance between playful and fashion-forward. As for accessories, Emma’s simple black heels keep the focus on the dress, and sleek silver cuffs and black star studs accentuate but don’t overwhelm the high style of the dress. To make this look work for everyday, start with a statement of your own: a pair of brightly colored skinny jeans, one of fall’s top trends. For this look, royal blue is the way to go, since blue is one of the primary colors in Emma’s dress. Trend number two in this outfit is the peplum, shown in both white and black options, to echo the other prominent colors in Emma’s outfit. The black top is more of a formal piece, and incorporates the third element of lace. The white choice is better suited for everyday wear, but it can be dressed up as well. A contrasting belt adds that little something extra, and simple black flats, a silver cuff, and a small pair of star studs complete this striking look. 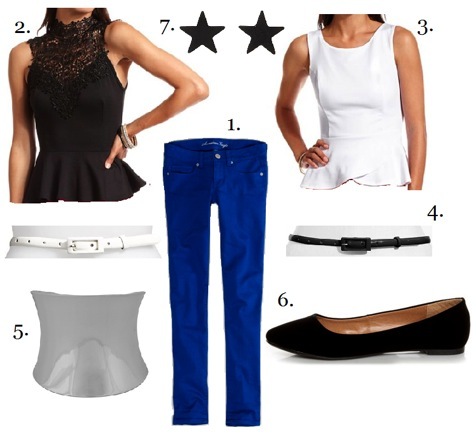 Emma’s look is right on trend for fall, incorporating peplum, lace and print. Three strong trends in one outfit may work on the red carpet, but it could overwhelm anywhere else, which is why the pattern element of Emma’s look is being left out of this adaptation. This look can be dressed up or down, and don’t hesitate to rock a red lip for a little extra style cred!